Either the driver of this Boston Public Schools bus is enjoying a fantastically laid-back lunch hour, or some kids in a Boston school district are on the coolest field trip ever. 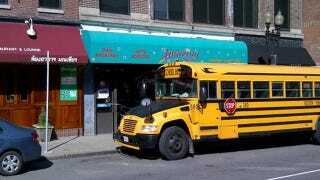 Kamil K of Hooniverse tweeted this picture, stating "Boston Public School bus parked in front of an adult store/strip joint. Awesome." We couldn't agree more. The store appears to be this one, which we'll note for any concerned parents out there gets surprisingly positive Yelp reviews.